For those who want to learn how to develop Flex based applications this is your lucky day. I have just got an email that will give you access to 30 days free online video training. 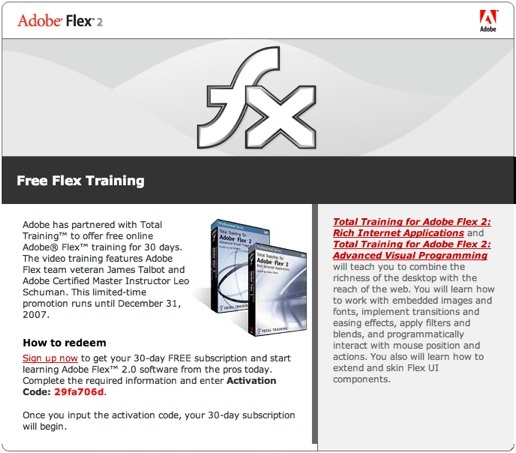 Adobe has partnered with Total Training™ to offer free online Adobe® Flex™ training for 30 days. The video training features Adobe Flex team veteran James Talbot and Adobe Certified Master Instructor Leo Schuman. This limited-time promotion runs until December 31, 2007. The original email is below (there is a bit more blurb on it if you are interested).